What the hell happened to your arms? I said to myself this morning. Though perhaps I should have been more stern and said, What the hell happened to your arms…Joe? Though the answer eluded me for a moment it did become clear where the scratches and scrapes came from. Except for the bruise. I already knew that came from the door I knocked over the other day and tried to stop with my forearm. At least the discoloration could stand behind its accomplishment: the door did not smash the chair in its path. Those pesky scratches though, they were no accident. Not at all. Just the product of thoughtless zeal. Zeal to bag the piles of sprawling and spiraling vines that had been cut down. 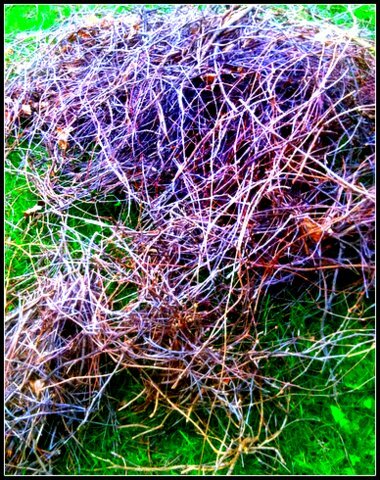 Zeal brought on by the passing of the rain, the easing of the cold and the effrontery of the bedraggled eyesore fire hazard piles of vines. The kind of zeal that brings energy and motivation that is fool hardy to turn away. The energy you know is fleeting. You don’t want to end up with trailing clouds of motivation, do you? I grabbed some gloves and some bags and dove right in. Unwieldy to say the least. Like trying to wrestling ten-foot-long carnivorous, barbed spaghetti. I put my sunglasses on to stop my eyes from being scratched out. Perhaps a pitchfork and a giant spoon would have made it easier. Tripping and stumbling in the tangled mess at my feet didn’t help. Some snakes and quicksand and I would have been right at home in the Amazon. Though a machete wouldn’t have proven so helpful against dead vines on the ground, it would have been therapeutic. And I needed therapy. Even the swearing wasn’t helping. You know what else wasn’t helping? The short sleeve shirt I was wearing. Not one bit. At this point I should have gone all Putin on it and tore my shirt off. If I was going to show the vines who was boss I needed to go all shirtless on them. Nothing says command like a bare chest. And a horse. A horse to stomp on the vines. Nothing instills submission like being stomped on. So that’s how I got my scratches…Joe. If you’re going to show the vines who’s the boss, you’re going to have to get a few scratches. This entry was posted in Personality and tagged bruises, Putin, scrapes, scratches, shirtless, spring, vines, yard work. Bookmark the permalink.